I reviewed the DigitalStorm Bolt not too long ago and found it to be a mostly good product in concept, but flawed in execution in two major ways: price and acoustics. When I met with DigitalStorm, I had the opportunity to see the current generation Bolt firsthand. I don't want to be so arrogant as to assume that the changes made to it are the result of my review, but I can tell you they've fixed most of my major complaints, and I'll be getting another one in to see these changes firsthand. While I didn't get a chance to see if the internal cable spaghetti is improved, I can say they've done a bang-up job fixing the glossy paint job on the shell. They now offer the Bolt in a white version, they're using a different paint for the black one, and they're offering custom airbrush art which, I'm sorry, I think is totally sweet. My second issue was the acoustics; they've since figured out that the power supply was basically running much hotter than it needed to, so they installed a higher quality power supply and ventilated the panel to install a blower fan to keep the PSU cool. The result was a Bolt that was audibly less...audible. They also brought the prices down a touch while offering system SSDs standard instead of the caching solution they originally had on their high end. DigitalStorm may be sending an updated Bolt in the near future, if they do I'll run a quick test and report back. The other system they had on display was their Aventum II. We were originally scheduled to receive and review the first generation Aventum, but the second version was so close to completion that they skipped it. 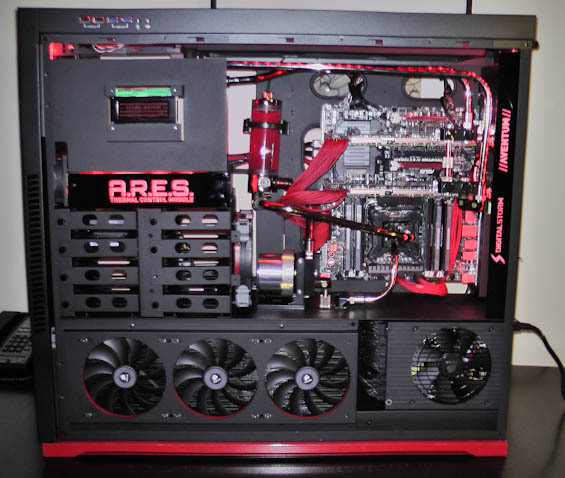 The Aventum II is about as custom as it gets, with a completely custom designed chassis, their own custom thermal monitoring and fan control solution, and an extremely aggressive watercooling solution with three 360mm radiators and copper-nickel tubing. This is a sports car kind of custom rig, starting at roughly five grand and only going up from there. 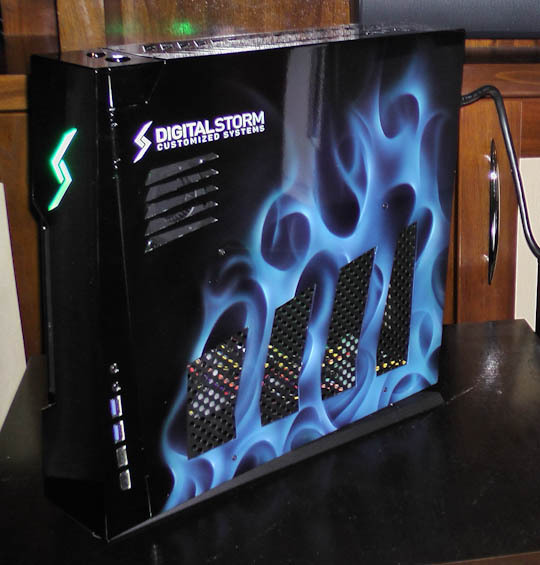 DigitalStorm is also looking at adapting it into a custom workstation design since the capability is certainly there. Ultimately what I saw from DigitalStorm was a lot of progress towards differentiating themselves as a boutique, which is part of the larger theme I observed even from last year's CES: boutiques in general are moving in their own directions and starting to offer things their competitors can't and even many do-it-yourself builders can't. The plan is to review the Aventum II when it's fully formed and finalized, so keep your eyes open.